Team Kaliber is going home with $80,000 and a CWL title. The first event of the new Call of Duty World League season is in the books, and the season-opening champions have been crowned. Team Kaliber has won the CWL Dallas Open with their 3-2 victory over Splyce in the grand finals. This is the first major CoD title in tK’s four-year organization history. The grand finals kicked off with Sainte Marie du Mont Hardpoint. Despite starting slow and allowing Splyce to hold the lead for well over half of the game, tK climbed back behind the play of Kenny Williams. Kenny’s 36 kills were the most on his team, but it was his late-game heroics that stood out. His last-second play finalized tK’s 250-230 victory in the first map of the grand finals. Commentators Clint “Maven” Evans and Jack “CouRage” Dunlop mentioned that Ardennes Forest Search and Destroy was well in tK’s comfort zone, and that proved to be true. It was a complete team effort with all but one player on Team Kaliber finishing with positive Kill/Death ratio. Team Kaliber took the map by a score of 6-2 to improve their series lead to 2-0. Ardennes Forest Capture The Flag was a very low-scoring game. Both teams were passive, presumably afraid of being punished for any mistake. But after a scoreless first half, Splyce became more aggressive. In a last-minute push, the Europeans killed all four tK players right before pulling the flag, securing a capture with just 30 seconds left to get on the board in the grand finals. Heading into the grand finals, tK played Ardennes Forest Hardpoint five times. They won every single time. This sixth and final time was different. Splyce fought all the way with tK, and finally took control of the game after reaching the 220-point mark. Arguably the most important play of the game came when Splyce’s Ben Bance pushed up and put pressure on tK ahead of the Splyce-controlled Hardpoint in order to buy his team some time to set up for a hard tK push. His team repaid the favor with a solid hold and a 250-225 win. The final game, Sainte Marie du Mont Search and Destroy, was all Team Kaliber. TK took the first two rounds in nearly flawless fashion. Splyce then lost in the third round after having a three-vs-two advantage. The theme of the fourth round was the use of tK’s scorestreaks. After losing three rounds in a row, tK found the magic that got them to a four-round lead. 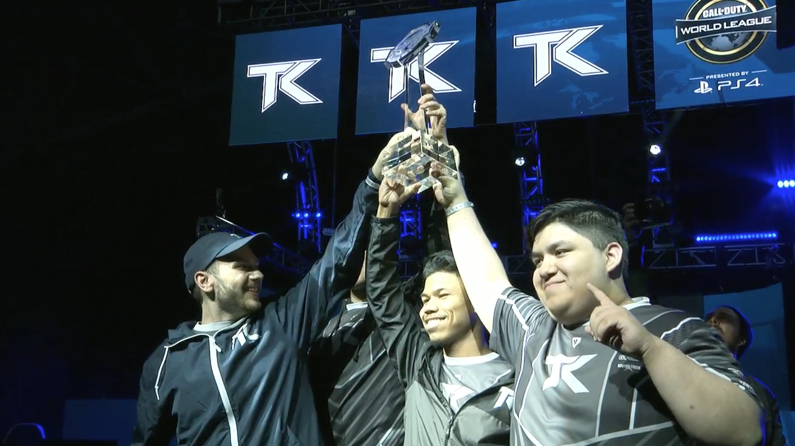 With the final two round wins, Team Kaliber clinched the CWL Dallas Open title. Following tK’s title celebration, Lamar “Accuracy” Abedi was awarded the Astro Gaming Most Valuable Player award for this tournament. The next time Accuracy and Team Kaliber will be in action is next weekend when they compete at the CWL Northern Arena Showdown against seven of the best teams in the world. And they will get to defend their open tournament championship at the CWL New Orleans Open, which starts on Jan. 12.